“The book shall be hid from the eyes of the world, that the eyes of none shall behold it save it be that three witnesses shall behold it, by the power of God … And there is none other which shall view it, save it be a few according to the will of God” (2 Nephi 27:12–13). It is likely that the translation of this passage prompted Oliver Cowdery, David Whitmer, and Martin Harris to seek an opportunity to see the plates as the Three Witnesses Nephi mentioned. Oliver remembered, “It was a clear, open beautiful day” when they saw the angel and the plates, probably in late-June 1829. Though they each left the Church for a time, all three frequently, and unashamedly, bore witness to seeing the plates throughout their lives. In addition to the three, Nephi also saw that there would “be a few [which shall view it] according the will of God, to bear testimony of his word unto the children of men” (2 Nephi 27:13). In 1 Peter 3:20, the author talks about “the days of Noah … wherein few, that is, eight souls were saved by water” (emphasis added). Since Nephi also used the word few, it is possible that Joseph Smith understood that word to call for eight further witnesses. It was probably later that same week in June 1829, that the eight Book of Mormon Witnesses were shown the plates, and unlike the Three, they were allowed to handle them. These were Joseph Smith Sr., Hyrum Smith, Samuel H. Smith, Hiram Page, Christian Whitmer, Jacob Whitmer, Peter Whitmer Jr., and John Whitmer. Like the Three Witnesses, none of the Eight ever denied their testimony, despite some leaving the Church. These witnesses were expected to “testify to the truth of the book and the things therein” and “to bear testimony of [God’s] word unto the children of men” (2 Nephi 27:12–13). While this was fulfilled with their statements published in the Book of Mormon, each of these men took their call to testify seriously and made several statements throughout their lives describing their experience with the plates. I have never heard that any one of the three or eight witnesses ever denied the testimony that they have borne to the Book as published in the first edition of the Book of Mormon. … Our names have gone forth to all nations, tongues and people as a divine revelation from God. And it will bring to pass the designs of God according to the declaration therein contained. Nephi also stated that the Lord would show the plates to “as many witnesses as seemeth him good” (2 Nephi 27:14). Many Latter-day Saints are not aware that, consistent with this verse of scripture, there were other, “unofficial” witnesses to the plates. Most of these people had accidental or incidental experiences with the plates. Josiah Stowell, for instance, caught a glimpse of the plates when a corner of the covering slipped off as Joseph handed them to him. Significantly, Mary Whitmer, mother of four of the Eight Witnesses, had a divinely sanctioned encounter. She was shown the plates by the angel Moroni. Other women, such as the prophet’s mother Lucy, and his wife Emma, interacted with the plates, bore witness of their reality and testified to the truth of the Book of Mormon. Figure 4 Seven of the Eight Witnesses. 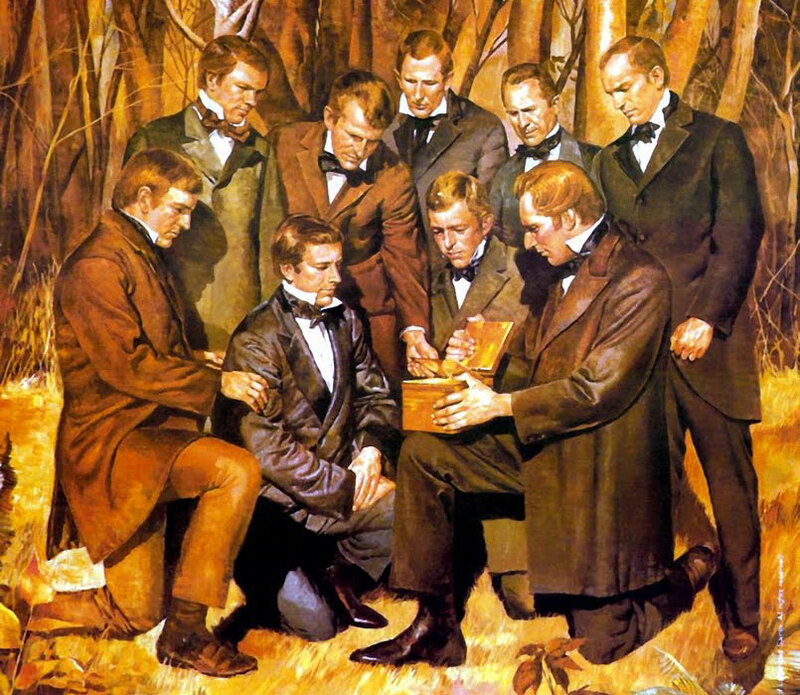 From left to right: Peter Whitmer, Samuel H. Smith, Joseph Smith Sr., Hyrum Smith, Jacob Whitmer, John Whitmer, Hirum Page. Image by Book of Mormon Central. According to President Ezra Taft Benson, the witnesses to the Book of Mormon are part of the Lord’s “built in … proof system of the Book of Mormon.” Many have commented on the evidentiary value of the witnesses. After seeing the plates, all of them bore witness to what they knew to the end of their lives, even as some “tended to compete rather than cooperate with [Joseph Smith’s] leadership.” When outside the Church, some faced immense peer-pressure to deny their testimonies, yet they held firm to what they saw and heard. John W. Welch, “The Miraculous Translation of the Book of Mormon,” in Opening the Heavens: Accounts of Divine Manifestations, ed. John W. Welch with Erick B. Carlson (Salt Lake City and Provo, UT: Deseret Book and BYU Press, 2005), 97. The other possibility is that it was Ether 5:2–4, but this is less likely because it is not as specific. Furthermore, since the best evidence indicates that Joseph Smith translated Mosiah–Moroni first, then went back to translate the small plates (1 Nephi–Words of Mormon), 2 Nephi 27 lines up better chronologically. Other evidence from the manuscript editions of the History of the Church also supports this view. See Welch, “The Miraculous Translation,” 113 n.91, 115–117 n.111. Oliver H.P. Cowdery to Cornelius C. Blatchly, November 9, 1829, printed in Cornelius C. Blatchly, “The New Bible,” Gospel Luminary 2, no. 49 (December 10, 1829): 194. (accessed January 12, 2016). Gale Yancey Anderson, “Eleven Witnesses Behold the Plates,” Journal of Mormon History 38, no. 2 (Spring 2012): 146–152 reasons that it was Sunday, June 28, 1829. See Richard Lloyd Anderson, Investigating the Book of Mormon Witnesses (Salt Lake City, UT: Deseret Book, 1981), 37–120 for background on the Three Witnesses. Anderson, “Eleven Witnesses Behold the Plates,” 152–156 suggests that it was Thursday, July 2, 1829. See Anderson, Investigating, 123–149; Richard Lloyd Anderson, “Attempts to Redefine the Experience of the Eight Witnesses,” Journal of Book of Mormon Studies 14, no. 1 (2005): 18–31, 125–127. See, generally, Anderson, Investigating; Richard Lloyd Anderson, “Personal Writings of the Book of Mormon Witnesses,” in Book of Mormon Authorship Revisited: The Evidence for Ancient Origins, ed. Noel B. Reynolds (Provo, UT: FARMS, 1997), 39–60. Also see Steven C. Harper, “The Eleven Witnesses,” in The Coming Forth of the Book of Mormon: A Marvelous Work and a Wonder, ed. Dennis L. Largey, Andrew H. Hedges, John Hilton III, and Kerry Hull (Salt Lake City and Provo, UT: Deseret Book and Religious Studies Center, Brigham Young University, 2015), 117–132. John Whitmer to Mark H. Forest [Forscutt], March 5, 1876; cited in Anderson, “Personal Writings,” 55. See “Mormonism,” New England Christian Herald 4, no. 6 (Boston, Massachusetts; November 7, 1832); reprinted in Morning Star 8, no. 29 (Limerick, Maine; November 16, 1832); transcripts online at https://www.sidneyrigdon.com/dbroadhu/NE/miscne01.htm#110732 and https://www.sidneyrigdon.com/dbroadhu/NE/miscMe01.htm#111632 respectively (accessed August 2, 2015). Three different accounts are all transcribed in Royal Skousen, “Another Account of Mary Whitmer’s Viewing of the Golden Plates,” Interpreter: A Journal of Mormon Scripture 10 (2014): 35–44. See Amy Easton-Flake and Rachel Cope, “A Multiplicity of Witnesses: Women and the Translation Process,” in The Coming Forth of the Book of Mormon, 133–153. President Ezra Taft Benson, “The Book of Mormon and the Doctrine and Covenants,” Ensign (May 1987): 83. This “proof system” also includes Moroni 10:3–5 and the Lord’s witness as found in the Doctrine and Covenants. Harper, “The Eleven Witnesses,” 119. Richard Lyman Bushman, “The Recovery of the Book of Mormon,” in Book of Mormon Authorship Revisited, 33. Richard Lloyd Anderson, “Cowdery, Oliver,” in Encyclopedia of Mormonism, 1:338, brackets added. Mitchell K. Schaefer, “‘The Testimony of Men’: William E. McLellin and the Book of Mormon Witnesses,” BYU Studies Quarterly 50, no. 1 (2011): 99–110, quote on p. 109.